This 5 meter (16.5ft) high-quality MPO to 12x LC(6 Duplex) Fanout/breakout Cable, MPO Connector Female without PIN. Jacketed with compounds that emit limited smoke and no halogen when exposed to high heat sources(Low-smoke-zero-halogen Rated). Insertion loss: 35dB, Insert- pull test: 500times<0.5 dB. For QSFP+ Transceivers Link, Contact us for OEM or Custom. This MPO breakout/fan-out fiber cable is ready for deployment in any multimode 50/125 MTP/MPO network. OM3 is fully backward-compatible with existing OM2 or OM1 systems. 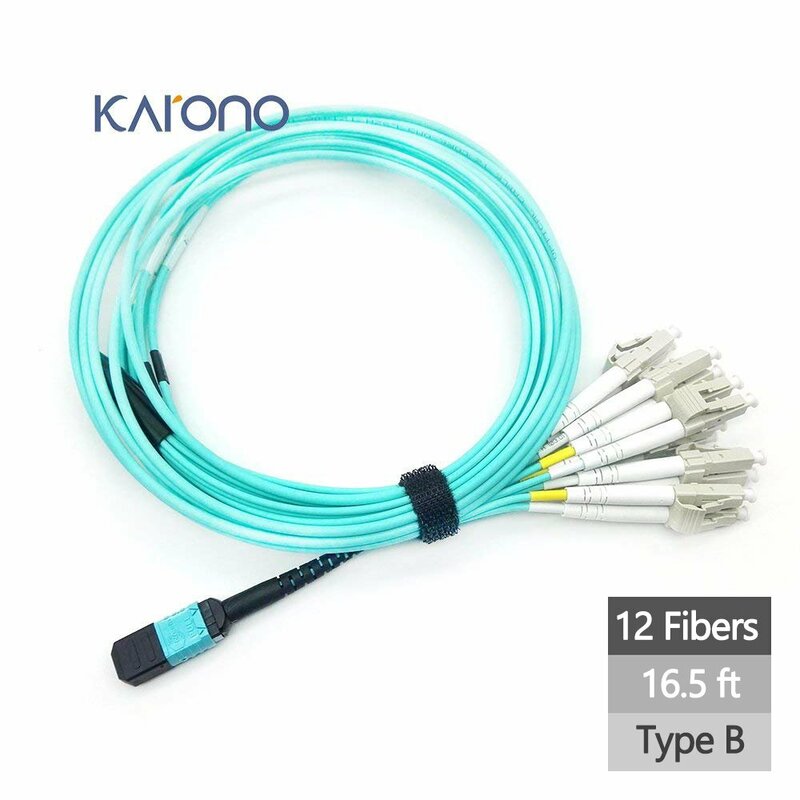 This multimode, MPO fiber cable is comprised of 12 fibers or 6 duplex channels within each connector. These high density cables are perfect when you have limited space, making it possible to run a single cable that automatically terminates 12 fibers in one easy plug-in. The fan-out side has 12 LC connectors that are numbered according to the fiber position in the MPO Connector and duplexed together. The push-pull release mechanism for the MPO connector is easy to engage and disengage, its latch design also prevents the plug from snagging when jumper cables are being routed.